A jury holdout (Henry Fonda) attempts to prevent a miscarriage of justice by forcing his colleagues to reconsider the evidence. When you think about when it was made, the takedown of fairly overt racism in the movie is quite admirable. On the other hand, the glaring absence of any women in the jury stands out like a claxon. Point of fact, the tide of the deliberations turns on some pretty eye-rolling sexism regarding vanity. I suppose par for the course in '57, but insulting as hell when viewed by today's eyes. And speaking of viewing, if you've ever sat on a jury, you'd know that there's no way in hell anyone could notice the small crucial detail regarding the key witness' eyeglasses from the jury box. For me, it's a huge weakness in an otherwise taut, dramatic plot. All that said, it's still a great movie, well worth watching. And speaking of viewing, if you've ever sat on a jury, you'd know that there's no way in hell anyone could notice the small crucial detail regarding the key witness' eyeglasses from the jury box. I'm not sure I agree - because the first thing that the juror notices is not the marks on the witness' nose - but rather the reflex rubbing of the marks as she gives testimony. 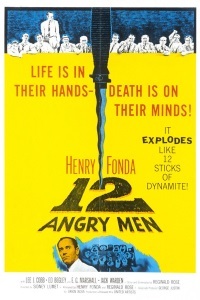 For me, 12 Angry Men is one of the best films about politics: everything is here from blustering to bigotry. But there is also the quite important message about the power of observation, facts and argument to get people to change sides. It is quite optimistic in that regard. AV Club, arguing for the prosecution. Are you sure that's AV Club and not Slate? I love this movie. Just love it. Amazing performances, direction and camera work. One of my absolute favorites. I also highly recommend checking out the TV movie version William Friedkin directed in 2007. They did some awesome reinterpretations of the some of the jurors in that one. A really top notch film from an excellent play. The acting is so good, it's hard to believe. Henry Fonda is really awesome in this one. A really top notch film from an excellent play. I had always presumed, because the film is so stagey (in a good way) that 12 Angry Men had originated as a theatrical play and had been adapted for film. Not so, apparently, it was written as a teleplay. Wow! I think it is sign of the persuasive strength of the film that we are so happy to see 'the Kid' given a 'not guilty' verdict - that not only us as the audience - but also the makers of the film itself - are willing to overlook overlook the evidence right in front of us about his culpability. Here is a follow up to the AV Club article which tries to put some figures behind the assumptions in terms of Bayes theorem. TLDR: Evidence from the film can be used to show that the Kid has a 98% chance of being guilty - comfortably above the 85% ish odds that normally form the border line of "reasonable doubt". However - the poster appears not to have considered the (rather low) baseline odds a murder being patricide (see comments in the article) - that is just about the only thing that could help to lower those odds in the defendant's favour.